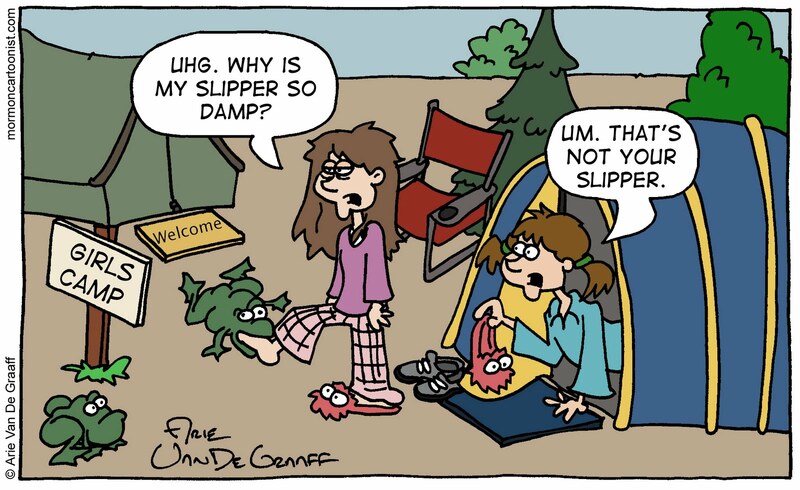 Today's gag comes from faithful reader Melissa W. For eight out of the last nine years, I found myself at girls camp (usually because I was following my wife). This year, I won't be there and this makes me very sad. I'll miss the quality of activities and the camping toughness of the girls plus the food's much better than what you get with the boy scouts. Ultimately, though, what I'll miss most about girls camp is the treasure trove of ideas girls camp has produced over the years. I appreciate the mention. Girls Camp rocks! 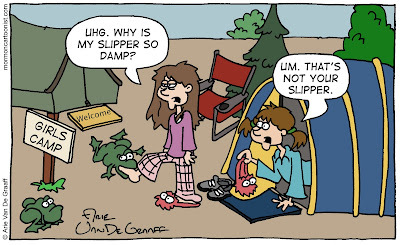 When our family went camping once, our shoes got wet and Marc put them by the fire to dry. When we woke up in the morning and I went to put them on, mine were melted to a point where they wouldn't fit on my feet. I had to spend the next 2 days hiking around with my heels out of my shoes. Frog slippers didn't even occur to me. Girls camp, ward basketball, pinewood derby, High Priests--where would a Mormon cartoonist be without such rich sources of material? You're right, Eric, without our unique culture there wouldn't be enough material to draw Mormon cartoons. This is why the domain www.protestantcartoonist.com is still available. The welcome mat that you drew in front of the tent shows that you are a true Girls Camp Veteran. I love that Girls Camp always includes the little things that make camping more comfortable.